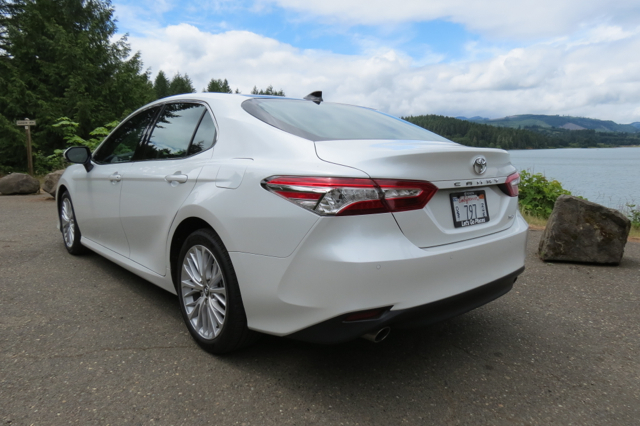 The eighth-generation Toyota Camry is the largest, most powerful and efficient one yet. as journalists review this next-generation sedan. The 2018 Toyota Camry will soon debut, an all-new model that launches this midsize sedan’s eighth generation. The new Camry is a clean sheet redesign and is the latest model built on the Toyota New Global Architecture (TNGA). Long the best-selling car in America, the 2018 Camry is larger, offers more powerful engines, and is the most fuel-efficient one to date. You have to go all the way back to the 1983 model year to find the first Camry, a compact vehicle available in sedan and hatchback body styles. In 1989, the first US-built model rolled out and as the years passed, the Camry grew in size, taking on midsize proportions. The ensuing years revealed coupe, convertible and wagon versions. 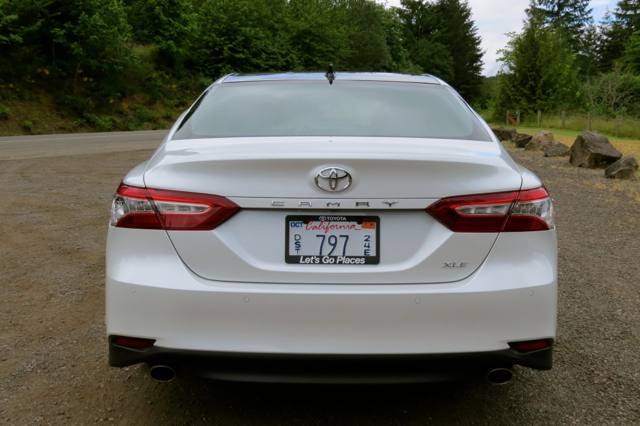 In recent years the Camry dispensed with the other body styles and now is only available as a sedan. 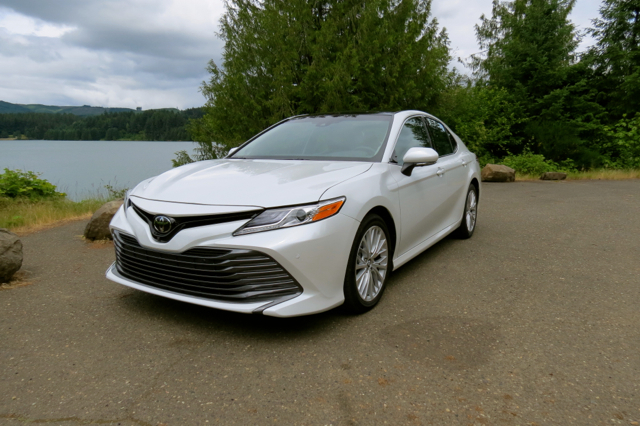 A hybrid variant rolled out in 2007; we examined the 2018 Camry Hybrid separately here. Not only has the front fascia for the all-new Camry received an overhaul, but take note of the design differences between select grades. In recent years, manufacturers have tweaked the grilles on some models by grade — Toyota’s full-size Tundra pickup truck is one example of this practice. Equipment levels vary by trim. 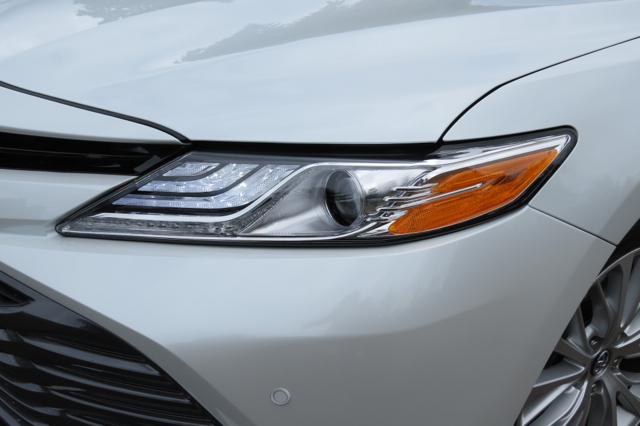 The Camry L has a black front grille, 16-inch steel wheels and a single exhaust. 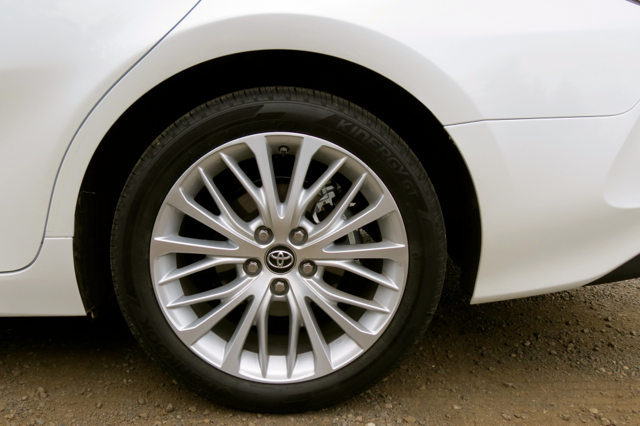 The LE upgrades to 17-inch alloy wheels. The SE retains the black grille, but adds a sport mesh insert. Other changes include color-keyed sport side rocker panels, a rear spoiler, a single exhaust with dual chrome tips, and 18-inch machined-finish alloy wheels. 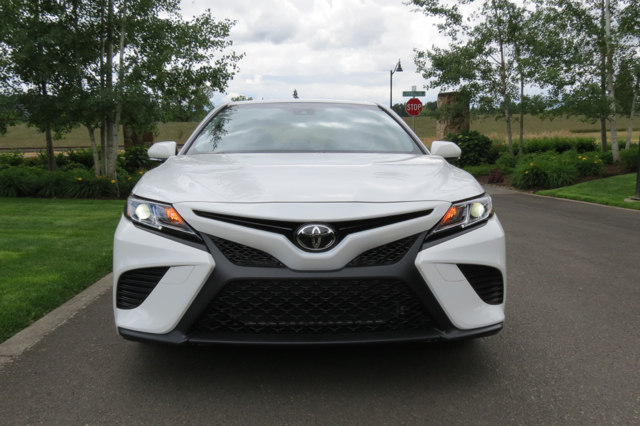 The Camry XSE has a gloss black grille with the sport mesh insert, upgraded LED light treatments, 19-inch machine-finished alloy wheels and a dual exhaust with quad chrome tips, a Camry first. V6-powered models also have a panoramic glass roof with a power tilt and slide moonroof. The XLE grade offers 18-inch wheels and a bright metallic front grille. The 2018 Camry sits on a 111.2-inch wheelbase, up from the previous 109.3 inches. Its overall length is now 192.7 inches. The larger footprint translates into more room for passengers. 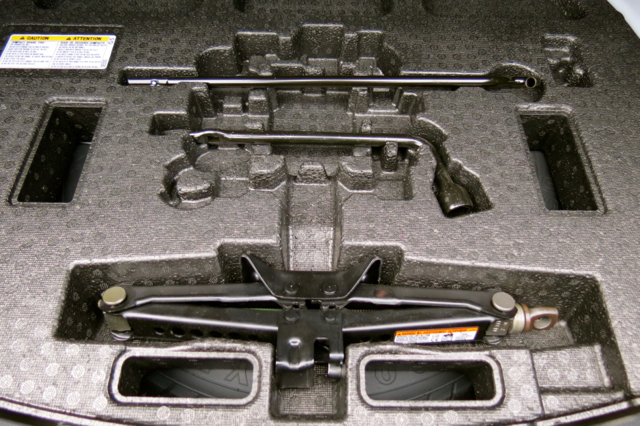 Trunk space measures 15.1 cubic feet (14.1 cubic feet in the Camry L). The now longer Camry astride Henry Hagg Lake in Oregon. A modern dashboard punctuated by an Entune 3.0 telematics system. The roomy cabin is loaded with standard features. Beyond the expected tilt and telescopic steering column, full power accessories, and air conditioning, you’ll find a generous amount of soft touch materials and, yes, real wood trim. Keyless entry, an overhead console with a sunglass storage compartment, dual sun visors with sliding extensions, four cup holders and four drink holders are among the included features. 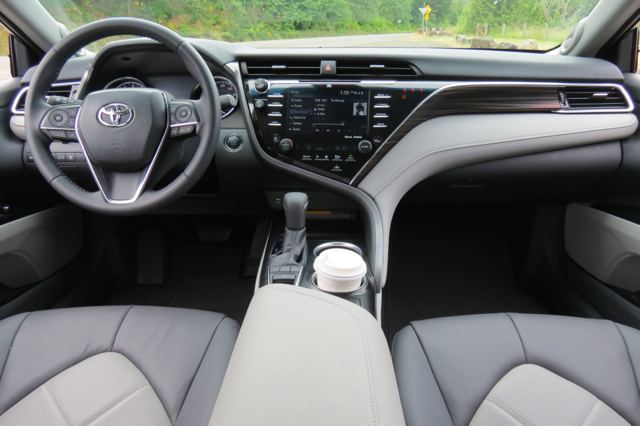 The Camry L has a fixed rear bench seat. 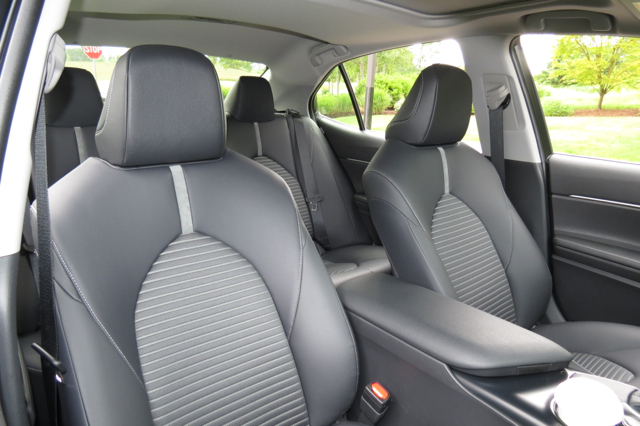 All other models are outfitted with a 60:40 split fold-down rear seat. Additional equipment includes dual-zone climate control, power front seats with driver lumbar support, heated front seats, metal trim and a leather-wrapped steering wheel. 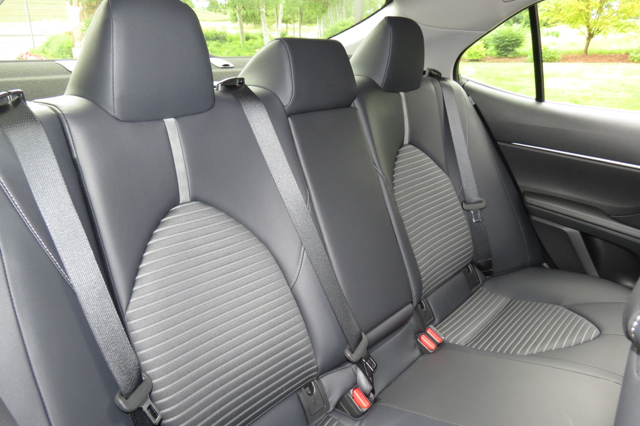 The Camry’s rear seat is suitable for three, most comfortable for two and offers improved legroom. A center position armrest contains two cupholders. 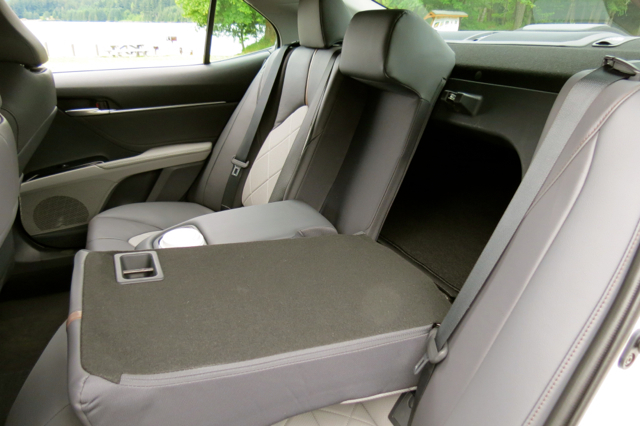 The Camry’s 60:40 split-fold down rear bench seat offers ease of access to the trunk. All models come equipped with dynamic radar cruise control. 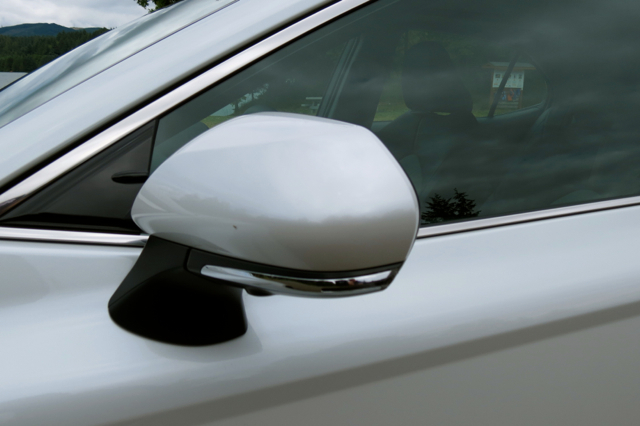 Further, all models except for the base trim have blind spot monitoring with rear cross traffic alert. The Entune 3.0 audio system comes standard and offers a seven-inch screen on most models and an eight-inch screen on the two top grades. A six-speaker audio system or a nine-speaker system can be had. Standard features include Navigation Scout GPS Link App (three-year subscription), Siri Eyes Free, Google voice controls, an Entune app suite and Bluetooth wireless technology. Available equipment includes a CD player, HD Radio, WiFi connectivity, and satellite radio. One USB outlet and one auxiliary audio port is included; two additional USB ports are available. The Camry’s tire change kit. 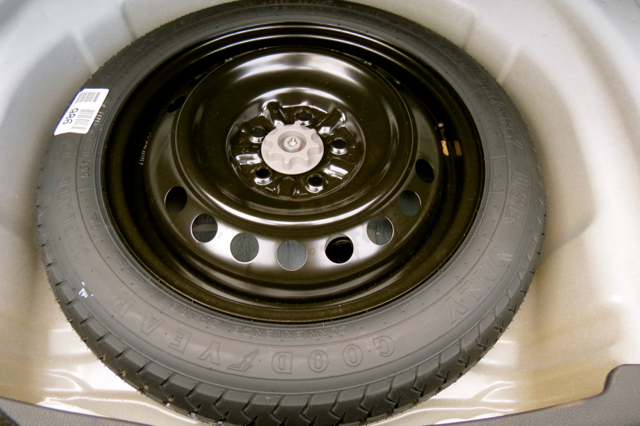 A temporary spare certainly beats a tire inflation kit. The Camry’s engine displacements are familiar. A 2.5-liter inline-four is standard; a 3.5-liter V6 is available. Both engines come paired with an all-new eight-speed automatic transmission. The two engines are new or updated for 2018. The base engine makes 206 horsepower and 186 pound-feet of torque. The V6 makes 301 horsepower and 267 pound-feet of torque. Despite the power increase, the 2018 Camry is more efficient than ever. 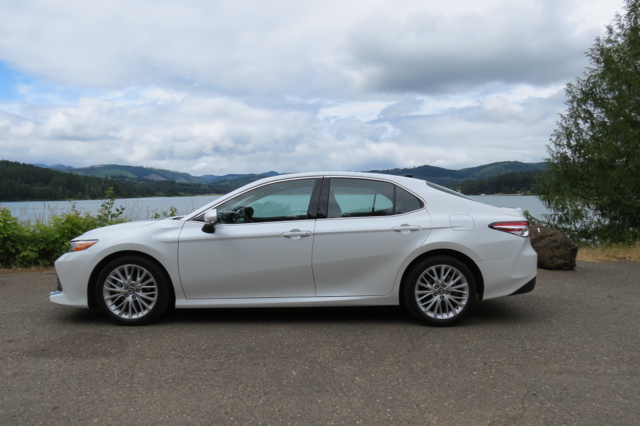 The four-cylinder makes an EPA-estimated 28 mpg city and 39 mpg highway (29/41 for the Camry L). The V6 comes in at 22 mpg city and 33 mpg highway. 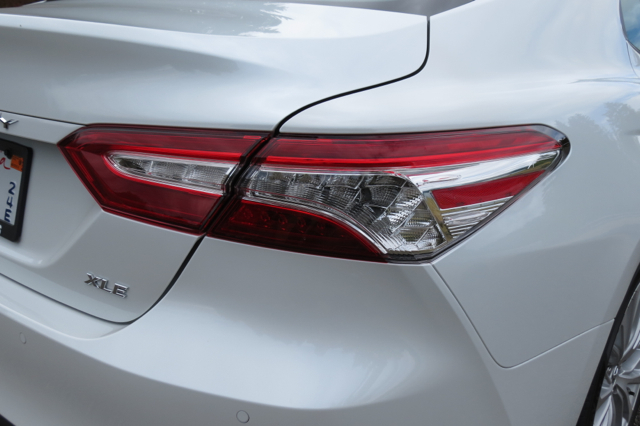 Both numbers put the Camry at the top of its class. 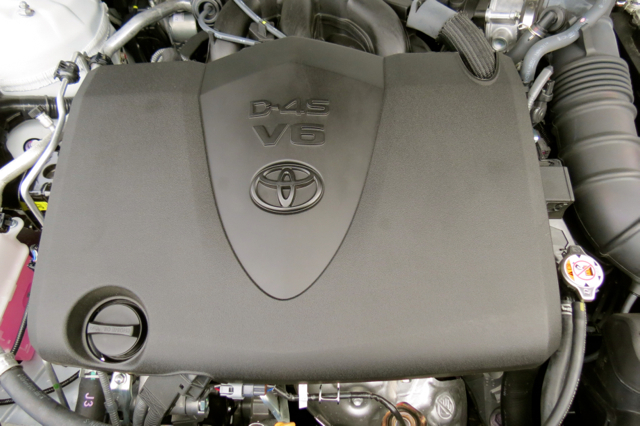 Camry shoppers once again have a choice of four- and six-cylinder engines. Both are paired with an eight-speed automatic transmission. 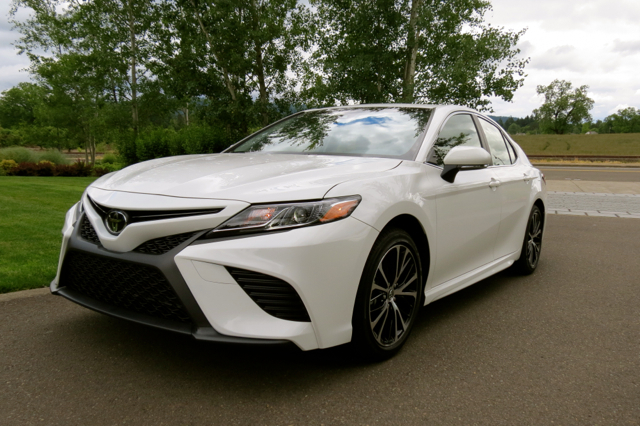 Pricing for the 2018 Camry is as follows: Camry L ($23,495), plus an $885 delivery fee. Additional grades and prices are as follows: LE ($24,000), SE ($25,200), XLE ($28,450), XSE ($29,000), XLE V6 ($34,400), and XSE V6 ($34,950). As for the 2018 Camry Hybrid, three grades are offered: HV LE ($27,800), HV SE ($29,500), and HV XLE ($32,250). The new Camry arrives in US showrooms in late July. Not every Camry on display was roadworthy. 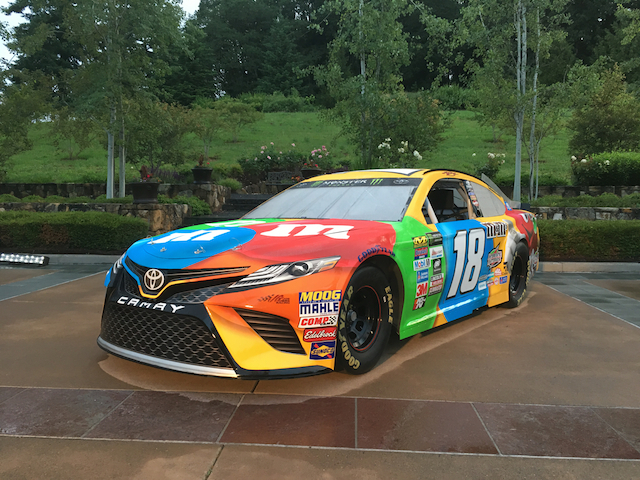 Indeed, the NASCAR-ready Camry XSE driven by Kyle Busch was offered for display purposes only. Sadly, we weren’t given the option to do track time. In any case, the race car was on view in front of the Allison Inn & Spa, where guests posed and took pictures. Toyota Camry No. 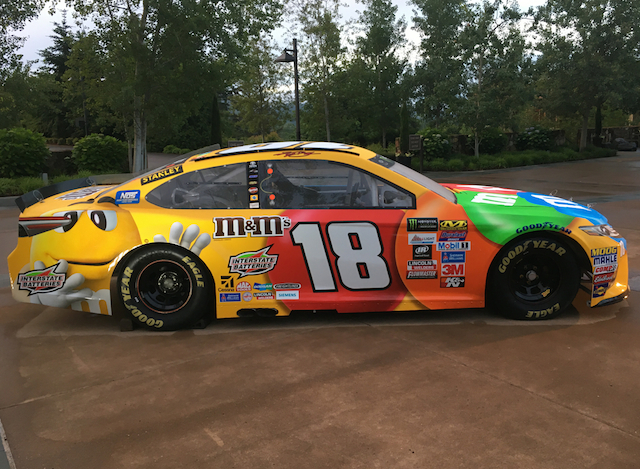 18 driven by Kyle Busch. Busch’s current race car is styled after the 2018 Camry. 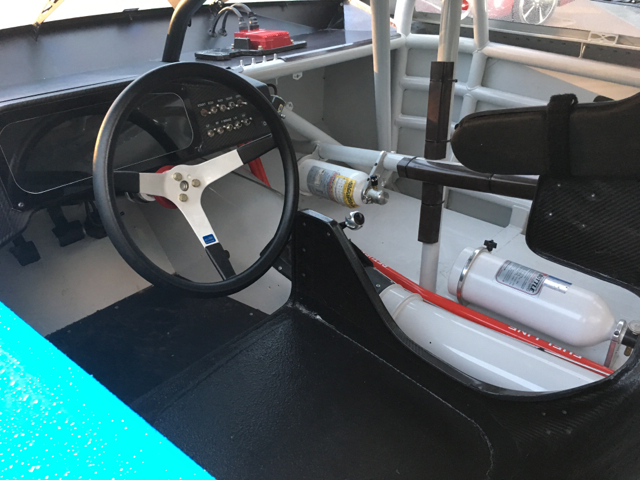 Behind the wheel of Busch’s No. 18 Camry.